Linda Bloodworth-Thomason was the best friend of the Clintons in Hollywood. She and her husband Harry were a powerful producing team in Hollywood who produced Designing Women among other TV shows. 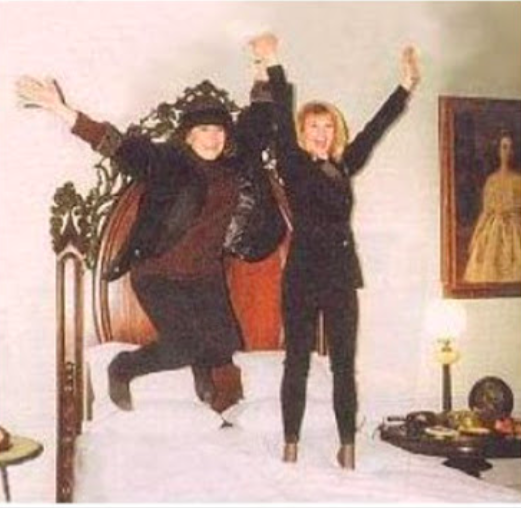 If you’re old enough you may even remember the scandal when she was invited to stay over in the White House during Bill Clinton’s term and, with actress Markie Post, jumped up and down on the bed in the Lincoln Bedroom. If she knew about Weinstein, Hillary knew. Plus, Thomasen admits she told three Democratic operatives. So, yes, they did know. They didn’t care and took the money anyway. As more and more women have come forward, A-listers who are normally intrepid, social injustice sniffers have scrambled to condemn Weinstein and announce that they had no idea all this was going on. Some said this despite knowing him for decades, starring in his films and being friends with accusers who starred in his films. OK. Whatever. I, myself, was a member of a “Let’s Bring Harvey Weinstein Down” lunch club, and I don’t even work in features. However, I will be the first to admit that clearly delineated moral choices can still be painfully complex where friendship is involved. One of the best friends I will ever have and a man I love dearly, former President Bill Clinton, has certainly taxed my feminist conscience, but always without diminishing my affection. I even helped write his apology to the nation for his own sexual misconduct, was sitting next to him when he delivered it, and believe to this day it was based on something that was none of our business. And yes, some may call it hypocritical, but I confess to having had no problem warning at least three top-level Democratic operatives against allowing Harvey Weinstein to host political fundraisers. A warning that evidently (and to the glee of Fox News) fell on deaf ears. Anyway, instead of re-litigating how we all got here, we might now be better served to ask not whether we knew about Weinstein’s crimes, but rather why we didn’t make it our business to know —particularly we women who have even a modicum of power or financial success. Shouldn’t it be our job to ask the females around us — the secretaries, the personal assistants and makeup artists — “Are you being treated OK? Is anyone harassing you? If this is happening, I promise I’ll stand right beside you.” Wouldn’t that be a sweet world?